"His Majesty is searching for justice in a world where justice, if it exists, has become only another commodity for sale. Yet within his faith, King Akahi Nui fiercely clings to old myths, words, concepts of right and freedom and God's granted hope that gives comfort that justice will prevail." As usual latest events are described, but there is no explanation of what led up to them or caused them. News reports, especially on television, are typically given without much overt context. The news has become more like entertainment than information or education and filled with propaganda, misinformation and half truths. Even the "facts" that are presented are often wrong or misleading as seen once again on ABC's Good Morning America Weekend Edition with Drew Millhon, who interviewed His Majesty Akahi Nui and her Highness Akahi Wahine. Mr. Millhon was one of the rare few that the Majesties honored with showing their priceless documentation which included the 26 Ft. Royal Family Lineal Scroll and more that I will get into later. Drew Millhon as an anchor man and reporter just proved yet again that Mass Media is inherently corrupt and showed again how a small number of owners and editors exercise great power over what is communicated to large numbers of people. And that ABC and Drew Millhon like so many other propaganda journalists and reporters who shape the news providing selected information would rather give much more attention to misinformation, crime, disasters and strife than to the truth, facts, harmonious intentions, acts of kindness and win-win conflict resolution. But some media are much better than others, judged by the criteria of accuracy, quality and independence of special interests. The Americans Bulletin as well as other alternative news outlets believe that it is possible to promote and develop enlightened, responsive, truly educative mass media and Truth, which is why I chose this forum for this article. And with that allow me to lay some foundation; Majesty Akahi Nui is the 100% Royal Blue Blood Lineal Heir of the Kingdom of Hawaii a direct descendant of King Kamehameha III as documented by Honorable Lorrin Andrews; In the matter of the Estate of His Majesty Kamehameha III, Judge of Probate - Cause Number; 2410 dated April 2, 1853 by the Supreme Court of Hawaii. Majesty Akahi Nui is the lawful, rightful and legitimate owner of the Iolani Palace in Honolulu Hawaii and of which Majesty Akahi Nui is holder in due course of the only clear and lawful Deed and title for the last 8 years. And as King for the Kingdom of Hawaii Nation and as the 100% Royal Blue Blood Lineal Heir to the Kingdom Throne, Majesty Akahi Nui has Diplomatic Immunity and Diplomatic Standing, is inviolate and outside the jurisdiction of the STATE OF HAWAII de-facto government. 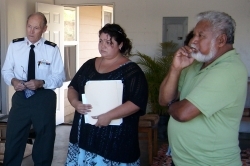 On August 15, 2008 His Royal Majesty King Akahi Nui along with his Queen, Cabinet Members, House of Nobles and Royal Guards were forced against their will to leave the Iolani Palace, handcuffed and arrested by a Foreign Jurisdiction. This Palace is rightfully the property of the 'Kingdom of Hawai'i' and is owned by and lawfully belongs to King Majesty Akahi Nui and Queen Akahi Wahine. 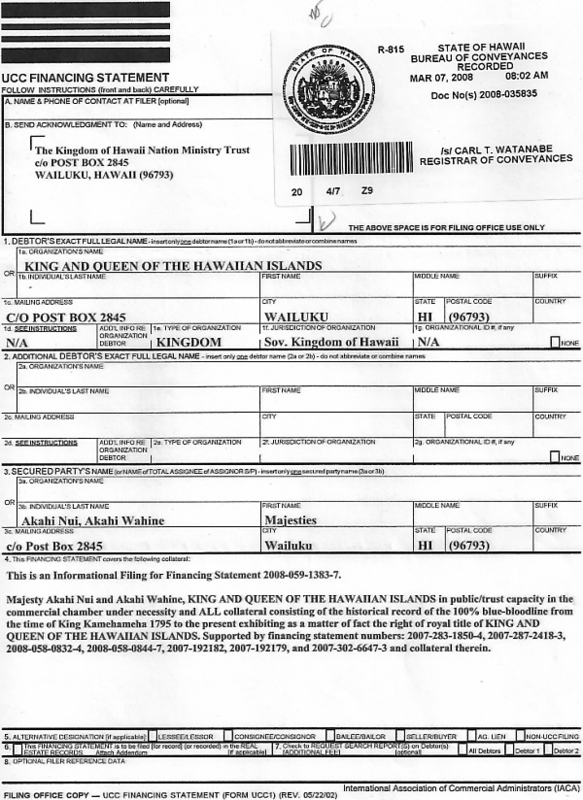 Majesty Akahi Nui holds the only clear and lawful Title and Deed to the Iolani Palace which was recorded out of necessity at the STATE OF HAWAII BUREAU OF CONVEYANCES on December 14, 2000 at 10:00AM and reference therein to Document No. : of 2000-176035 TAX KEY MAP No. : 2-1-25-2. The Palace of the Royal Family is located on the Island of Oahu, inwhich Majesty Akahi Nui holds the only true and lawful clear Title and Deed not only to the Island of Oahu, but of all the Islands of Hawai'i. The Oahu Deed was recorded out of necessity at the STATE OF HAWAII BUREAU OF CONVEYANCES January 11, 2002 and holds the Document No. : of R2002005573/ R20022005574. The Majesties, their Cabinet Members and Royal Guards have been "Informationally Charged" with Burglary of a second degree and forced to appearance into a foreign venue tribunal, under threat, duress and coercion but more importantly, in violation of their/our sovereignty. All this... so-called alleged burglary, for entering their own Property. The STATE OF HAWAII by and through several of their agents and officers are all intertwined, connected and who have all continued to impose a conspired agenda of prejudicial, malicious and wonton reckless actions in their ongoing blatant discrimination against the Majesties, his Cabinet Members and Royal Guards, federal Marshal, the Kanaka Maoli people, Hawaiian aboriginals, Hawaiian Nationals and most recent and immediately have affected his and her Majesty's and subjects within The Kingdom of Hawaii Nation and those who remain under the sovereign authority of King Akahi Nui of the Hawaiian Islands. In a letter I sent to the Council for the Defense of Human Rights and Freedoms, I state how our world, our people and the Sovereign Kingdom of Hawai'i Nation have been subjected to involuntary servitude and a regime that is only concerned in keeping the people subjugated to policies, laws and codes to extract revenue and leaving the people as mere subjects without rights and being forced under pains and penalties to recognize the STATE OF HAWAII, INC., a mere de-facto Corporation as having omnipotent power and authority over the rights and lives of the people basically stated, we as a people have succumbed and supported a system that is no longer sensitive to people, but to non people--to corporations, to money and to power. The letter also included short explanation of the intertwined conspirators who are all officers, agents and assigns of the STATE CORPORATION that calls itself THE STATE OF HAWAII (INC.). 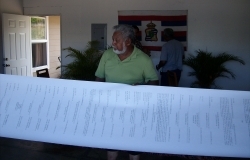 ALL of these Agents and Assigns of the STATE have ALL taken an OATH OF OFFICE to DEFEND AND UPHOLD THE CONSTITUTION FOR THE UNITED STATES and THE CONSITUTION OF THE STATE OF HAWAII, however, ALL Conspirators are in violation of their oath of office and are blatantly violating the un-a-lien-able God given rights of the people of the Kingdom of Hawai'i Nation through their continuing conspired agenda of prejudicial, malicious, wanton reckless actions and ongoing blatant acts of discrimination. 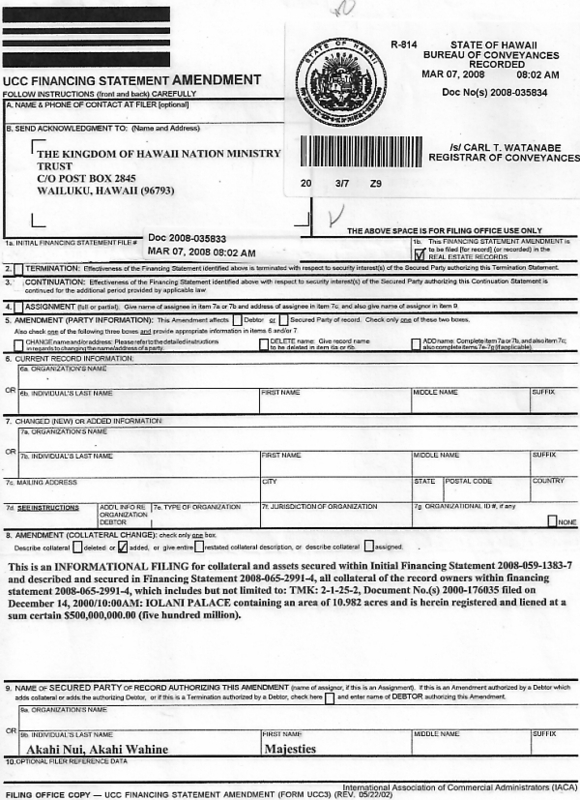 The STATE OF HAWAII, INC. government indeed has no intent to protect the rights of the Kanaka Maoli, the Hawaiian Nationals or any of the Kingdom of Hawaii subjects who remain under and within the jurisdiction of the Kingdom of Hawaii, as history and present actions have shown and continue to prove. The STATE OF HAWAII, INC., government has but one purpose, as it remains today, the disengagement of these inhabitants from society as it continues to strip them of any and all God given rights and freedoms from birth and later as stated in the Constitution for the State of Hawaii article 12 section 7 which all conspirators have blatantly violated. As far as the alleged "charges" and the current status of the alleged so called case brought forth by the STATE OF HAWAII ATTORNEY GENERALS OFFICE, MARK MIYAHIRA DEPUTY ATTORNEY GENERAL and the "Information" provided by HENRY NOBRIGA, SPECIAL AGENT FOR THE ATTORNEY GENERALS OFFICE; THE STATE OF HAWAII, INC., has failed and refused to bring forward proof of their authority, have failed to prove subject matter jurisdiction and in personum jurisdiction of the matter and parties hereto. The STATE OF HAWAII has failed to prove it has a superior Title to Hawaiian Island lands and the Iolani Palace and without said proof continues its onslaught of our rights and continues it malicious miscarriage of justice as a tyrant. All of these facts have been raised and given by Judicial Notice and Declaration. Each Judge of this Foreign De-facto Tribunal has been made aware of the facts and each judge has chosen to deliberately ignore the ramifications of such judicial misconduct and criminal activity. Both the STATES ATTORNEY GENERALS OFFICE and the so-called courts of the STATE OF HAWAII have failed and refused to prove jurisdiction and title in this matter and therefore are committing fraud and treason against the Kingdom of Hawai´i. Of course our challenge here, as the Kingdom of Hawaii Nation and as the appointed Consul to represent said Kingdom, is to demonstrate that we can still be a nation, a sovereign government and a country where the rights of the individual, despite their race, color, and religion, remain supreme. And if we as a people allow this to be not so, then we are all lost. If this is not so, it is because we have forgotten the lessons of our histories, the history of Hawai'i as a Sovereign Nation as well as the history of the American Revolution, we have forgotten the country's and people that have stood, sacrificed and committed their lives to defend and protect their right to be free from the bonds of servitude and to exercise rights freely determined by a people implementing the right of self-determination... and in this case, by the Kingdom of Hawai'i Nation to further our dignity, prosperity and liberty. All of the confirming facts surrounding the legitimacy of His Majesty Akahi Nui and Akahi Wahine as King and Queen of the Hawaiian Islands was given and presented to ABC's Anchorman Reporter Drew Millhon of Good Morning America Weekend Edition during an interview in front of the Iolani Palace in Honolulu Hawaii, on October 6, 2008. When Good Morning Americas Drew Millhon called to arrange an interview he stated it would be extensive, up to three hours of interviewing and on sovereignty issues. In reality the interview was approximately 30 minutes, Mr. Millhon was shown, Certified Deeds, Titles and as I said before the "Scroll of the Royal family's Lineage". He was also shown a very rare and unique document kept in a 5" thick protected binder that has only been brought out on one other occasion, the actual Original Sealed Trust of King Kamahameha that clearly identifies "Akahi" as the DIRECT LINEAL DESCENT of the late Great King excluding all accusations of being "self proclaimed" and confirming that Majesty Akahi Nui is the King of the Hawaiian Islands. He is who he says he is. 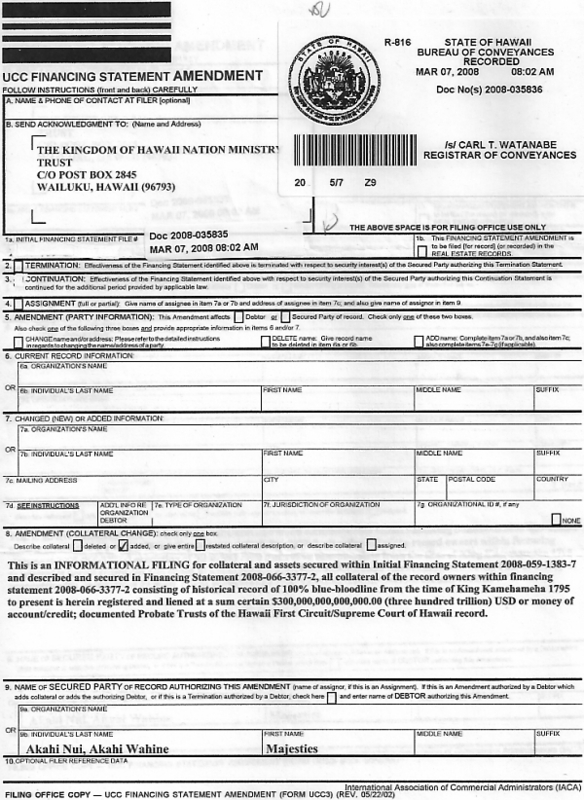 Mr. Millhon was also given a copy of the "Financing Statements" securing the Royal Families Interest in not only the Iolani Palace (a $500 Million Dollar Security Interest ) but also the infamous Financing Statement filed in mid 2007 on the Islands of Hawaii (a $100 Trillion Dollar Security Interest). With all this self evident documentation given to Mr. Millhon he managed to, in the 30 second air time, inwhich the Majesties ultimately received when this piece was aired, was able to cause defamation of character, discourteous and flat out disrespectful statements and actions regarding His Majesty and Her Highness. First of all he called them a "Radical Recession Group", he referred to them by first names that were legally changed almost a decade ago, he reported that the Majesties had a 100 Trillion Dollar law-suit against the STATE OF HAWAII which is a total fabrication and false statement. I talked to Mr. Drew Millhon personally and after seeing the results of his interview, insights and abilities to report to America, the people and the masses around the world, I say "Here's to You Mr. Millhon! ", with news reporters like you helping to shape people's views of the world, reporting your pervasive source of unreality, fostering insecurity, lies and ignorance- our society and people will definitely be kept in the dark, that's good journalism there Mr. Millhon, I'm sure the Mass Media, powerful groups, governments and large corporations are pleased with your "Context" being the result of the assumptions behind the facts, and of course are pleased that this context is all the more powerful because it is neither stated nor discussed. In a better world, journalism is vital to the health of our democracy, the glue of information that holds this complex nation together, journalism tells us most of what we know about the world beyond our own experience by going where its audience cannot or will not. In a better world journalists and reporters keep watch on the government and other powerful institutions, exposing wrongdoing and injustice, these thoughts of a better world and good journalism are FAR from what I saw reported on Good Morning America Weekend Edition October 19, 2008, well hidden inside a piece called "How Hawaii Shaped Obama, it's well beyond what we see in our everyday papers and local channels, so in this day and age it is imperative that we seek to find the truth, to uncover the facts, to do our own research and take a big hard look around ourselves and see if we are part of the problem that we all face or part of the solution we all truly want. And so with all the distractions and obstacles at hand the Kingdom of Hawaii, it's King and Queen and their loyal subjects continue with their international obligations and connections and most important their ongoing quest and unwavering commitment to ensure and protect the Absolute Monarchy of the Kingdom of Hawaii Nation; these are truly the modern day warriors of the Hawaiian Nation.